The acidity of lemons means that they're packed full of cleaning power, with the added advantage that they're free from the chemicals contained in most household cleaning products. So next time you experience one of the following household emergencies, make the fruit bowl your first port of call! Clean queens Kim and Aggie suggest using lemons to clean copper and brass. Simply take half a lemon, dip it in some salt and get rubbing! The acid within the lemon dissolves the tarnish whilst the salt scrubs away tougher stains. Lemon juice can work wonders on wood Martha Stewart is just one advocate of this technique. In fact, many commercial wood polishes contain something called d-limonene, which is extracted from lemons and is especially effective at dissolving grease, so its ideal for wiping away fingerprints and other oily stains. Simply make up a solution of two parts olive oil and one part lemon juice, then dab a rag into the liquid and get polishing. If its good enough for Martha, its certainly good enough for us! Suffering from dry patches on your elbows? Simply take half a lemon, sprinkle on some baking soda and twist your elbow into the lemon as if you were juicing it. Give your elbow a quick rinse and hey presto - super soft skin! Incidentally, rubbing a slice of lemon on your hands after preparing heavily scented foods such as curry, garlic, fish or onion will neutralise odours, whilst the vitamin c will help to soften skin. If you are cutting up a lemon, do not throw the leftover sections away place them in the dishwasher to give your crockery extra shine and banish any nasty niffs. The astringent qualities of lemon also help to cut through grease, which is why its the main ingredient in so many washing up liquids. The average microwave can quickly take on a resemblance to some kind of crime scene if left neglected. To help loosen burnt-on stains, place a chopped lemon in a bowl of hot water and switch the microwave onto full power for three minutes. Afterwards, you will be able to wipe away those hard-to-remove stains with ease, and your microwave will smell pretty fab, too! All out of shoe polish? Kim and Aggie suggest using the pithy side of a lemon to shine black and dark brown shoes. We reckon the citrus scent will work wonders when it comes to masking sweaty foot odour, too. Rust stains can be a nightmare to remove, but when it comes to rust marks on clothing, a slice of lemon might just save the day. Simply rub the stain with a lemon slice before washing as usual. Insects hate the acid within lemon peel, so if you're suffering from a creepy crawly infestation, a few strips could be just the thing to keep bugs at bay simply place a few strips of lemon peel near the area in question. The secret of this tip lies in the presence of d-limonene with the peel, which is a natural insect repellent. 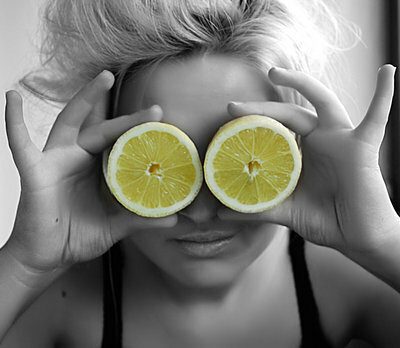 Lemon juice has anti bacterial properties, which means its an ideal disinfectant. Rubbing a slice of lemon on a chopping board wont just help get rid of bacteria but will also fade patches of dis-colouration and neutralise strong smells. It can also work wonders on graters and other hard-to-clean kitchen utensils. The citric acid in lemons can help break down lime scale deposits use a slice of lemon to wipe down bathroom taps or for a deeper clean, use a piece of string to hold a couple of slices of lemon around the base of your taps and remove after an hour, then wipe down for super shiny taps.